Her second collection, Tsigan: The Gypsy Poem, was published in French translation (Tzigane, le poème, Gitan, Scribe-l'Harmattan, 2014) and has been adapted for multi-media performances in the U.S. and Europe. Her first novel, Sur la Route, was published by Quale Press in 2015. Her honors include fellowships from the National Endowment for the Arts, the California Arts Council, Chateau de La Napoule Retreat for Artists, CEC/ArstLink International and the Center for International Theatre Development. Cecilia was born in Pittsburgh, Pennsylvania, and grew up there and in rural Kentucky, one of seven children of a homemaker and an airplane mechanic. She attended Transylvania University in Lexington, Kentucky, earning degrees in English and Theater Arts, before moving to Los Angeles in the early 1980's. She received her MFA in Creative Writing from Antioch University L.A. in 1999. A celebrated teacher, she has conducted poetry workshops for thousands of children and young people throughout the United States, as well as workshops for professional writers, educators, participants in Elderhostel programs for senior citizens, inmates at a prison for the criminally insane, and residents at a shelter for homeless women and their children. From 2006 to 2014, she was a member of the faculty in creative writing at the University of Southern California. She has collaborated with visual artists, theatre artists, musicians, dancers and filmmakers. The founding director of Summer Poetry in Idyllwild, The Istanbul Poetry Workshop and The Paris Poetry Workshop, she currently leads independent workshops for poets and writers around the world. 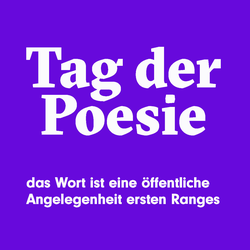 Gedichtplakat und Poesiekarte, Tag der Poesie 2015: "2006"